When I received an email from Suzanne Davenport in early summer 2013 that described her ambitious project to compile a book based on how Newtowners felt after 12/14, I admired her courage. Suzanne and I met as volunteers in the Newtown Volunteer Task Force Call Center where we received and returned phone calls and emails from the thousands of people around the country with offers to help the community. Like so many others, we both felt the need to keep busy as the sadness of the tragedy was so completely overwhelming. As the news media descended upon our small town, it was clear that the world wanted to understand Newtown. Rather than let outsiders define us, Suzanne proposed a book to let Newtowners speak for themselves, about Newtown, about 12/14, or anything else. “My goal is to show the world who Sandy Hook and Newtown are! We are not defined by one day in our lives.” Suzanne wrote in June 2013. Suzanne collected nearly one hundred handwritten letters from Newtowners. “A handwritten letter comes from the heart.” emphasized Suzanne in a letter to potential contributors. Six months later, in partnership with Karuna Publications, the “Letters from Sandy Hook – Newtown to the World,” is now available for sale. The publisher included the original letters with the typed text and added color photos of the town to produce a beautiful book in 8″ x 10″ format. “Letters” contains raw emotion: sweetness, sadness, and everything in between. Suzanne is donating 100% of her proceeds to Newtown charities including the Newtown Memorial Fund, a 501(c)(3) non-profit organization with the mission of providing care and support for the 26 victims’ families as well as creating a physical memorial in Newtown. 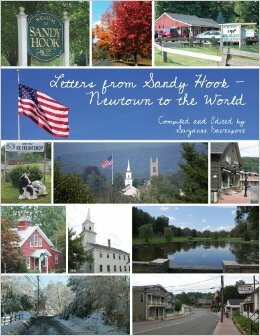 The book is available online from Amazon at “Letters from Sandy Hook – Newtown to the World.” Locals may also purchase the book at the Everything Newtown store in Newtown or Byrd’s Books in Bethel. If you know her, Suzanne is also selling the books directly. You may access Suzanne’s website here or the Facebook page here. Initially, I wasn’t sure that I could bear the sadness of putting my thoughts on paper for “Letters,” but in the end I wrote the story of my volunteerism. Like everyone else who contributed to the book, my tears are on every page.